Our Tour Squad high performance programme is designed for players who are looking to take their tennis more seriously. This programme is aimed at players wishing to compete and county, regional and national level. 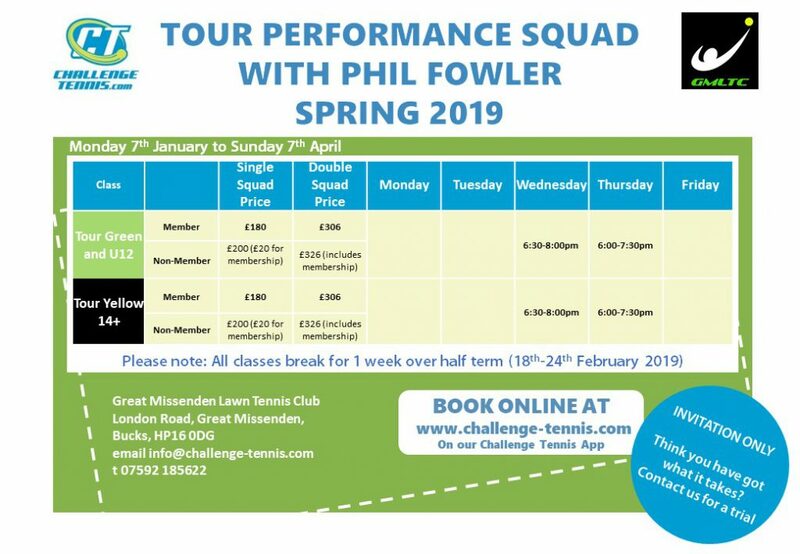 The squad sessions are run by our Lead Performance Coach, Phil Fowler at Great Missenden Lawn Tennis Club in a high intensity but enjoyable environment. We work with players to a high technical level in our squads as well as focusing on the tactical and mental side of the game. Players will also benefit from high quality Strength and Conditioning training which is offered to all squads. In this our athletes work on the functional movement skills required to not just be a great tennis player but a great athlete. In our Tour programme players get a comprehensive off court package, including, physical testing, help with tournament planning and support, technical analysis (including video feedback), reports and player profiling. We also offer our Tour programme players the opportunity to attend International Performance Camps, with their coaches, arranged by Challenge Tennis. These are open to non Challenge Tennis players. Our Tour squads are only for those players who are willing to commit time and dedication to tennis. The player will typically be expected to attend at least 2 squads as well as take one individual tennis and strength and conditioning session. Places on our Tour squad are strictly invite only.If you wish to have a trial for these squads please get into contact with us below.